The Nutanix Enterprise Cloud Platform provides hyper-converged infrastructures for software-defined data center management and improved operational agility for faster scaling. Delivering storage, compute and network resources as consolidated hardware nodes, Nutanix helps enterprises simplify and accelerate resource provisioning on demand, and the integrated architecture helps avoid the cost of procuring and managing external storage (SAN, NAS, etc.). The Nutanix Enterprise Cloud Platform supports common hypervisors such as VMware vSphere, Microsoft Hyper-V and Citrix XenServer. Another alternative is Nutanix’s own Acropolis Hypervisor (AHV) which can support server and desktop virtualization and is managed by the Nutanix Prism software. Nutanix Prism allows administrators to perform control functions on the target infrastructure – reconfiguring VMs, turning on and off VMs, etc. Monitoring of hypervisor and VM activity can also tracked from within the Nutanix Prism console. Nutanix Prism is ideal for virtualization administrators to administer and monitor their Nutanix Acropolis servers. However, IT operations teams are still responsible for the performance of all the applications and services in their infrastructure. Although insight into the Nutanix infrastructure is important, performance problems can occur due to many other causes: application code, storage infrastructure, networks, and more. Therefore, end-to-end visibility into every layer and every tier of the infrastructure can help achieve the proactive management and diagnosis capabilities required to ensure a great user experience, every time. 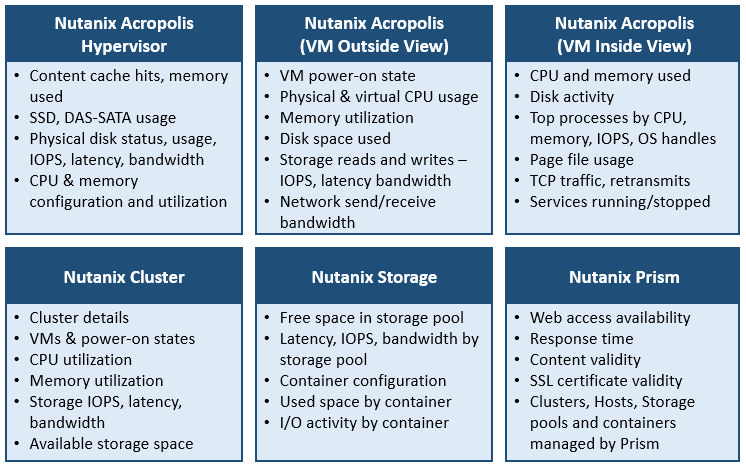 In-depth visibility into the Nutanix servers: The Nutanix servers and the Acropolis hypervisors supporting the VMs are among the most critical components of the infrastructure. It is important to monitor all key performance indicators of the hypervisor – compute and memory resources, network connectivity, virtualization platform, and storage disks – to identify performance bottlenecks at the hypervisor-level. Performance visibility into the VMs is also necessary to determine if a specific VM is taking up an unfair share of the hypervisor’s resources. If such a VM is identified, an immediate next question is “Why is the VM taking up a large amount of resources?” Metrics from the hypervisor layer do not answer this question. Therefore, monitoring tools must collect performance metrics from within the VM operating systems to determine why a specific VM is consuming a higher share of resources than other VMs.Additionally, Nutanix servers are configured in clusters, and storage resources are grouped in storage pools. For complete visibility into the virtual environment, IT operations teams need to track resource availability and usage at the cluster level and monitor the different storage pools in a cluster. A unified view of the entire Nutanix hyper-converged infrastructure with correlated insights into hypervisor, VM and application performance, combined with visual dependencies between these tiers, helps IT administrators understand the impact of performance problems and pinpoint their root cause. Go beyond performance monitoring and diagnosis (i.e., enabling infrastructure optimization and fine-tuning): Performance monitoring is not always about diagnosis. When the infrastructure is working well, metrics collected from the infrastructure can provide insights into how the infrastructure can be reorganized to handle a larger workload (i.e., increase scalability). Likewise, empirical data about utilization levels can be used to determine what investments are needed to support future growth. Track the user experience: A Nutanix performance problem not only affects application performance but also the end-user experience. By continuously monitoring user experience trends, IT administrators can proactively diagnose potential bottlenecks in the hyper-converged infrastructure. There are two major user experience monitoring techniques to consider: real user monitoring and synthetic monitoring. Both are complementary approaches and it is recommended that organizations deploy a combination of both approaches for total visibility. Capability to monitor every layer and every tier of the infrastructure: When a user complains that an application is slow, the problem could be due to the application code, the network, the database, the Active Directory that is used for authentication, or other factors. In-depth metrics from every tier of the infrastructure are essential for accurate problem detection and diagnosis. The key performance indicators for each tier are different. For example, for a Java application tier, the Java memory heap usage is a key metric. If it ever reaches close to 100%, the application performance will suffer. Likewise, for an Oracle database, index fragmentation levels are important to track. If fragmentation is high, database access will be slow. Detailed visibility of application-level metrics will help avoid finger-pointing between the application owners and Nutanix administrators in isolating the root cause of performance problems. 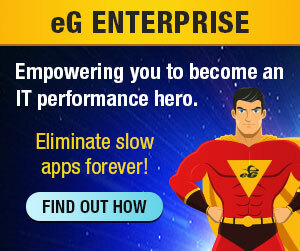 eG Enterprise is a total performance monitoring solution that monitors Nutanix infrastructures end to end, and delivers actionable insights, intelligent alerts and automatic baselines to speed up problem diagnosis and troubleshooting. Intuitive reports provide recommendations to right-size your infrastructure. With support for over 180 applications (enterprise applications, VDI, web applications, cloud applications etc.) out of the box, eG Enterprise ensures your business services running on Nutanix deliver high performance and superior user experience.